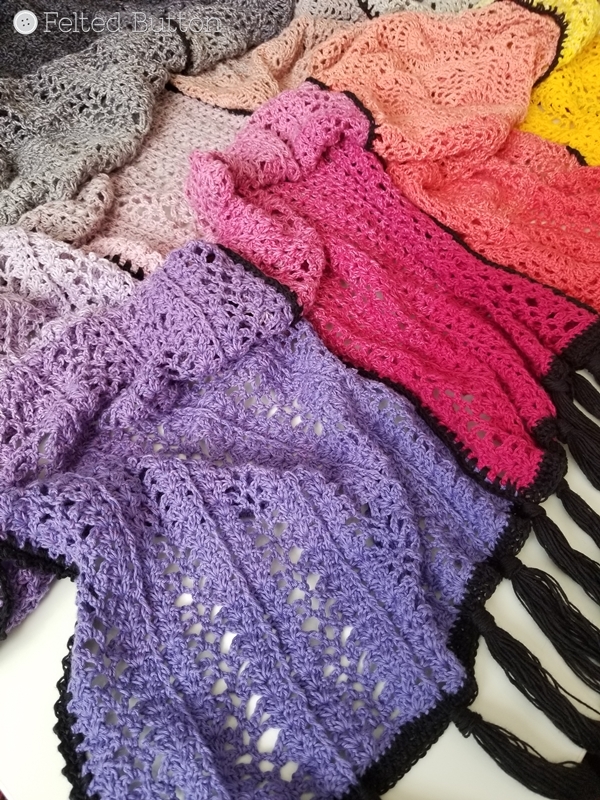 A few months back I was invited to design a blanket crochet pattern for Happily Hooked Magazine for their April issue this year. 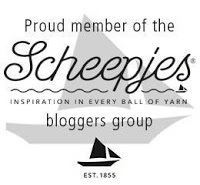 Since it was themed around cake yarns, I was thrilled because you might know that I've been a bit obsessed with Scheepjes Whirl* cakes lately. 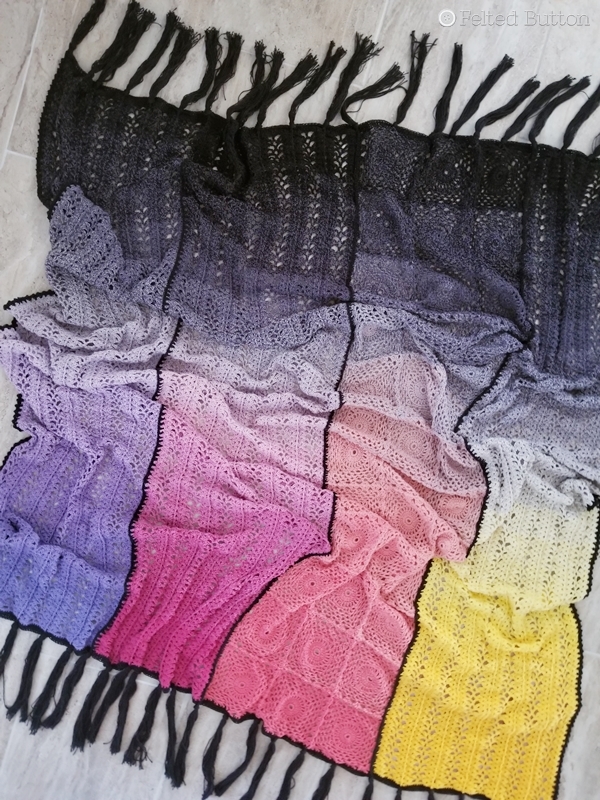 ...so my Aurora Blanket was born! And then I decided to make one of the four panels a little different for some interest--and a challenge to see if I could do it with the gradient and use up all four cakes evenly. Guess what?! It works! 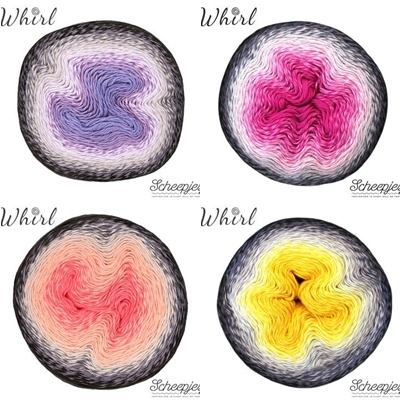 I am really pleased with the gradients of each Whirl. And the weight of the blanket is fabulous, too...lightweight, drapey but warm enough for mild weather or a cool house. Just a bit of snuggin'. These four colors are: Dark Grape Squish, Night Time Bubbles, Watermelon Hell Raiser, and Dandelion Munchies. They work so beautifully together, I think. 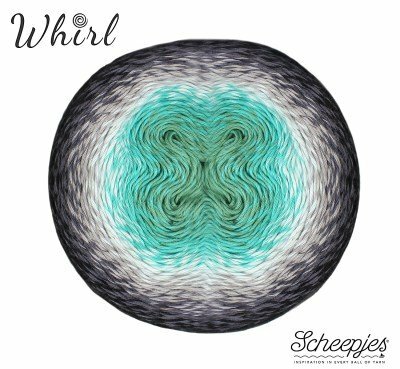 If you haven't used Scheepjes Whirl* before, it's worth a whirl (pun intended). Maybe it's obvious, but this yarn makes me feel like my hook is a magic wand and I'm a yarntist magician! Believe me, it will do the same for you. This is the one color of the Aurora Collection (Minty Black Velvet) that I didn't end up using--but it was so hard to leave it out. 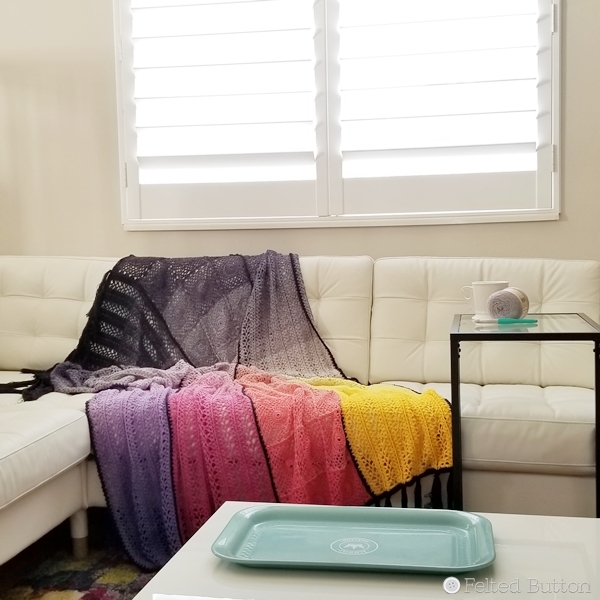 The reason I did was that the four Whirls make a perfectly sized blanket (57” x 65”/145cm x 165cm), but you could make any color combo with four of the five Aurora Collection Whirls to suit your taste. I used a smaller hook than usual (3.25mm) rather than my typical 4mm with this blanket. 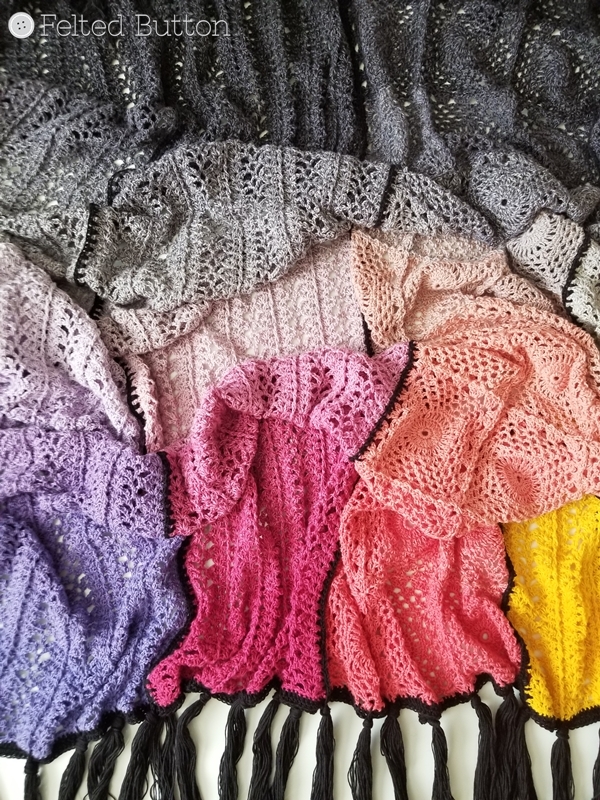 I chose this because the stitch pattern I created was already pretty open and lacey--and the drape was lovely, as you can see. A bigger hook seemed to lose a bit of stitch definition, too. For the border and joining, I used one coordinating Whirlette* in Liquorice. There was enough to add tassels, too, which I thought were retro and fun. But those are optional, of course. The pattern is rated for an intermediate crocheter only because the coral motif panel is worked join-as-you-go. It's pretty simple, though--an ambitious beginner could make it. And if that part seems intimidating, you can always leave out the motif panel and work it like the other three back and forth in rows, if you wish. And you can see some of my other patterns using Whirl here (free), here (free), and here. *If you are wanting to get your hooks into some Whirl, by using these links below it doesn't cost you any more but awards me a small commission. Thanks for your support! They all ship internationally, too! I've got another Whirl project on my hook and some REALLY EXCITING things happening behind the scenes on the Felted Button front. 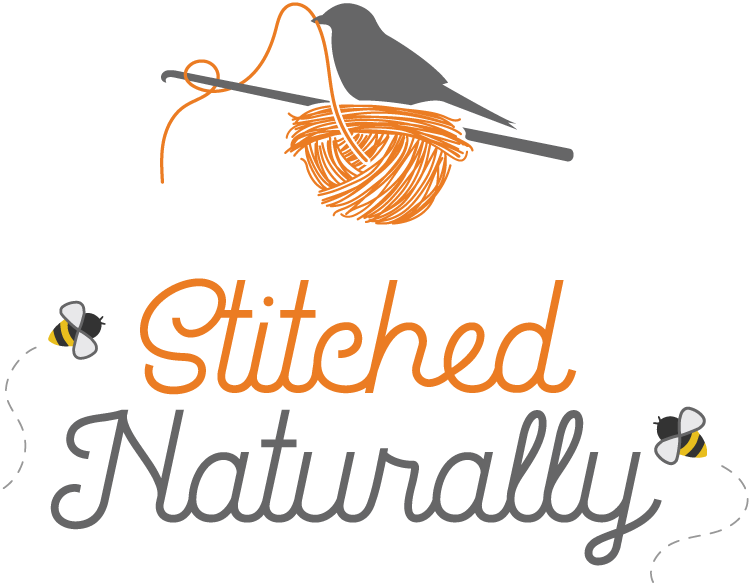 If you want to stay in the "Button" loop, the best places are Facebook here, Instagram (@FeltedButton) here and Pinterest here. I'm Felted Button everywhere and love to share my riotess life of color! I'll be back soon with another HUGE project that has been months in the making. Watch on my social media for sneaks and the BIG reveal! Since school is coming to a close, I'm off to pick up my son from his field day activities! I hope that you are ever so happy and well! | On the Board | -- When it rains, look for rainbows. When it's dark, look for stars. *This post contains affiliate links which if used by you costs you no more but provides me a small comission. Thanks for your support of my color-loving world!